This week’s episode of Boruto: Naruto Next Generations brought the current Mitsuki-centric arc to a close. After watching the very action-heavy ‘Onoki’s Will’, I’m interested to see what kind of consequences the writers decide to make Mitsuki face. While I did enjoy getting to know more about the way Mitsuki thinks, the current arc has come across as a bit of a drag, especially due to the side story involving Boruto and Garaga. Anyway, the good news is ‘Onoki’s Will’ gave the arc a satisfying conclusion. I liked how the episode explored the different layers of Mitsuki’s personality. Having been made in a laboratory, Mistuki will always feel different from those around him. I understood why he decided to go on his own with the Fabrications. He was curious about getting to meet others like him. Of course, they turned out to be evil and had to be destroyed but, even if it was just for a moment, they made Mitsuki feel he belonged. 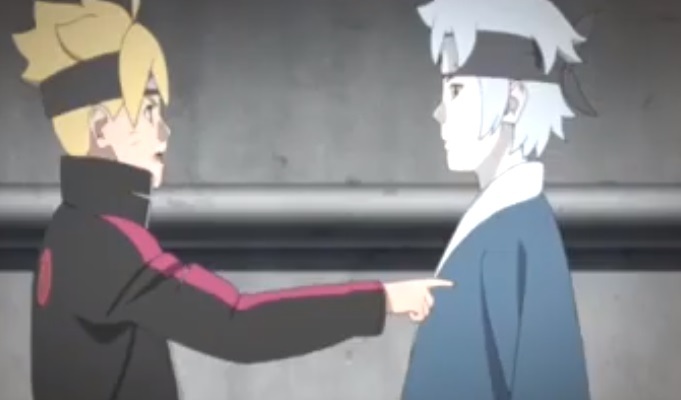 There was also a very interesting interaction between Boruto and Mistuki before their final confrontation with Ku. Mitsuki loves Boruto and will do anything to ensure his safety. I don’t know what the writers are thinking, but I’m liking some of their decisions a lot. They don’t shy away from the queerness present in Boruto and Mitsuki’s current relationship. Even if it is one-sided and Boruto doesn’t think of Mitsuki that way, at least the writers haven’t used Mitsuki’s feelings toward Boruto as a joke or make him feel embarrassed or ashamed. I have talked about how Onoki should be one to kill Ku, so it was good to see the writers thought the same. The old ninja gave everything he had to destroy the troublesome being he created. Now, I’m not sure if Onoki is dead. But if he is, I’m going to be a bit disappointed because it felt like a cop out to me. It allowed the writers to not worry about making sense of what kind of consequences Onoki should have to face. Let’s see what the next arc brings for our young heroes. Did you enjoy watching Boruto this week? What did you think of ‘Onoki’s Will? Let us know. Previous:Geekiary News Briefs! Batwoman Pilot Casting, Resident Evil TV Series, GLAAD Noms & More! Next: Jennifer Rowe (Emily Rodda) Awarded a Companion of the Order of Australia!